Department of Physiology, University of Kentucky College of Medicine, Lexington, Kentucky, USA. Address correspondence to: Jonathan Satin, Department of Physiology, University of Kentucky College of Medicine, 800 Rose Street, Lexington, Kentucky 40536-0298, USA. Phone: 859.323.5356. Email: jsatin1@uky.edu. J Clin Invest. 2019;129(2):496–498. https://doi.org/10.1172/JCI125958. Stressful situations provoke the fight-or-flight response, incurring rapid elevation of cardiac output via activation of protein kinase A (PKA). In this issue of the JCI, Yang et al. focus on the L-type calcium channel complex (LTCC), and their findings require reexamination of dogmatic principles. LTCC phosphorylation sites identified and studied to date are dispensable for PKA modulation of LTCC; however, a CaVβ2-CaV1.2 calcium channel interaction is now shown to be required. Yang et al. suggest a new hypothesis that LTCC modulation involves rearrangement of auxiliary proteins within the LTCC. 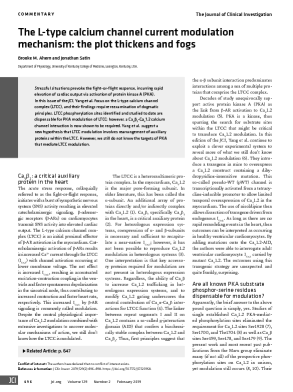 However, we still do not know the targets of PKA that mediate LTCC modulation.